Work environment matters because it has lots of effect on the mind, body and soul. Working in a dull and gloomy room certainly doesn’t inspire the employees. Imagine if workplace is optimistic and personalized, surely, it has the power to energize and motivate the workforce. Here are some simple yet inspiring office decorating ideas that’ll make the office a pleasant place. Comfort is not just stick to the home, we can also add a touch of comfort to the work place. Choose ergonomic office furniture that is comfortable and practical at the same time. Consider adding a beautiful and soft cushion to your desk chair that enhance productivity and comfort level. A great color scheme really makes the workplace more satisfying and inspiring. 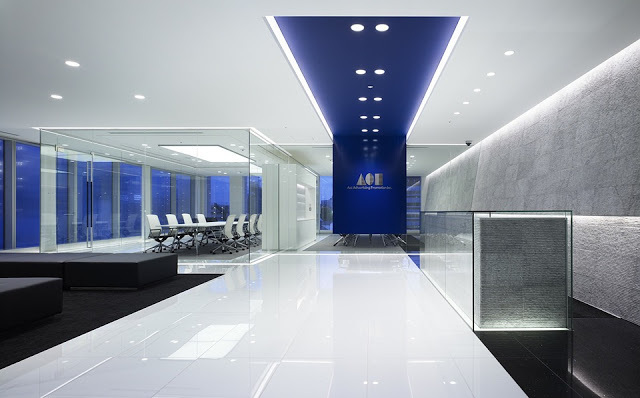 The rule of thumb is to integrate your brand color with your office color scheme. For the smaller workplace, if your brand logo is in bright color, consider painting one wall with your brand color and choose light colors for the rest of the walls. The neutral walls add sophistication while giving the illusion of larger space. If your office has beautiful surrounding or outside view, then highlight those landscapes. Consider, installing windows or floor-to-ceiling glass window that will make your office beautiful and inspiring. The one of the easiest ways to decorate your office to encourage your employees to decorate their space according to their taste. A personalized space will make your office environment pleasurable while keeping the employees motivated and energized throughout the day. Plants and flowers give a pleasant and fresh look to any place. Position plants and flowers at the center position where they can attract more attention, giving a pleasant look to your work place. You can also use potted plants to highlight different work stations and office areas. Burn some delicious candles and spritz that’ll give a relaxing and lively office environment. There are plenty options available in the market. Try to choose essential oil diffuser blended with the specific purpose like focus, energy, joy or peace. Color code all your office supplies including files, stationery, containers and holders, you can make your office more organized, cohesive and beautiful. You can color your stationery or files reflecting your brand’s color. Try out some brilliant storage ideas. If your office is small, tall or standing cabinetry will be a great option. Consider built-in-shelves, or laminated glass shelves that’ll give you more storage space while taking up less floor space. Sitting and doing work in one place can be boring. So, the easy solution is to add adjustable or standing desk in your office. Adjustable desks are great choice as they offer flexibility to get up and move, making you more productive and active. Integrate some art pieces in your workplace and get the walls talking to the employees, customers and visitors. Choose art pieces that reflect your brand message while enhancing employee morale and increase productivity.